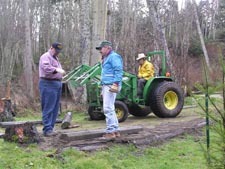 Clallam County Parks operates a volunteer program to help provide on going maintenance and visitor contact in the parks. There are a variety of ways to participate in the program. Weekly Park Projects: Each Tuesday morning a volunteer group meets for a 2 1/2 hour project. A schedule is created in advance so they know where to meet and the location of the project. 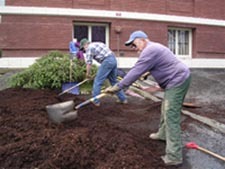 Most work is done in the Port Angeles and Sequim vicinity. Anyone interested in joining this group, please contact the Park Office. Contact information is at the bottom of this page. Scout, church, or business groups can schedule service projects according to their group capabilities and time frames. A variety of projects exist, but lead time may be necessary to get a project that will work for your group. 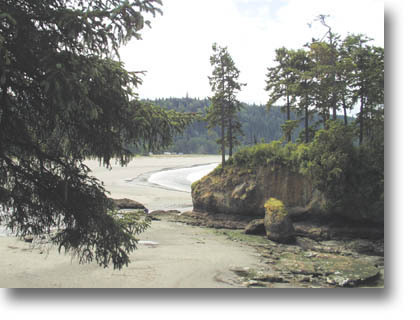 Camp Host: A minimum one month commitment is requested for these positions at Dungeness and Salt Creek Recreation Areas. 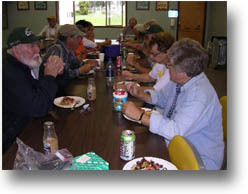 Individuals assist staff with campground maintenance and visitor contact. Please contact the park at which you want to volunteer. The Park Manager, at the site, will provide details of the camp host responsibilities and scheduling. Contact information is at the bottom of this page. Clallam County camp hosts are needed periodically. Full hookup site is provided in exchange for 28 hours of work per week at Dungeness Recreation Area, near Sequim, and Salt Creek Recreation Area, near Joyce. Both parks are across the Strait from Victoria, Canada. Memorial Bench or Table Donation Program: This program allows donors to provide for a park bench or picnic table to be installed in one of the Clallam County Parks or Fairgrounds in memorial of a loved one. Other donations ideas will be considered on a case-by-case basis. The cost of a donated bench or table is $1,100. This includes the cost of the product, shipping, taxes, installation, and other required installation items. All furnishings will be uniform with previously purchased products. Fairgrounds donations may be accepted if the individual being honored has a record of service or made an outstanding contribution at the Fairgrounds. It is up to the discretion of the Director to accept this donation. This requirement has been established due to the limited space available on the grounds and the number of requests received over the years. Placement of a donated item is at the discretion of the Director. A donor may request a specific park/property and a location within the park, but the Director will ultimately decide the exact location. Click on this link for a Request Form. Checks and money orders must be payable to "Clallam County Parks". The completed form and funds must be mailed or brought to the Parks Office, located at the Clallam County Courthouse. The address is: 223 E. 4th Street, Suite 7, Port Angeles WA 98362. Adopt-a-Park: A minimum one year commitment is requested for these positions. 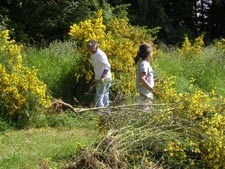 The volunteers are responsible for a specific task or trail in a park area which requires regular monitoring and/or work. Their work allows parks to be safer, better maintained and more closely monitored than current staffing levels can provide. Group and Individual Projects: Group and individual (including Eagle Scout) projects can be arranged upon request. Minimum age for group trail work is 15 years old, with parental permission required. Please try to give us as much notice as possible if you want to arrange a group project. Out of area groups are also welcome, as camping arrangements can be made. Adopt-a-Trail: A minimum one year commitment is requested for these positions. 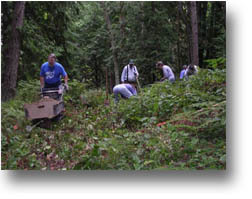 Adopt-a-Trail volunteers are responsible for regular monitoring of a trail segment. They walk or bike the trail every 1 to 2 weeks picking up litter, cutting back brush, pulling weeds, and other duties as needed. Adopters report any trail damage to the supervisor, as well as any illegal activities. Adopt-a-Trail volunteers are needed for the Verne Samuelson Trail. Contact and Application Information: For information regarding our camp host program contact Dungeness and Salt Creek Recreation Areas directly. Contact Dungeness at 360-683-5847, Email, or 554 Voice of America Road, Sequim, WA 98382; or Salt Creek at 360-928-3441, Email, or 3506 Camp Hayden Road, Port Angeles, WA 98363. For all other volunteer and donation opportunities contact the Park Office via Email or phone at 360-417-2291. For volunteer packets and applications, interested parties will be directed to the Clallam County Human Resources Department. The HR Department will provide the documents, orientation, and training required for all volunteers. The HR Department can be reached by Email or phone at 360-417-2396.